Activities about trees were not in our plans for the Fall, but when the child leads, the teacher follows. 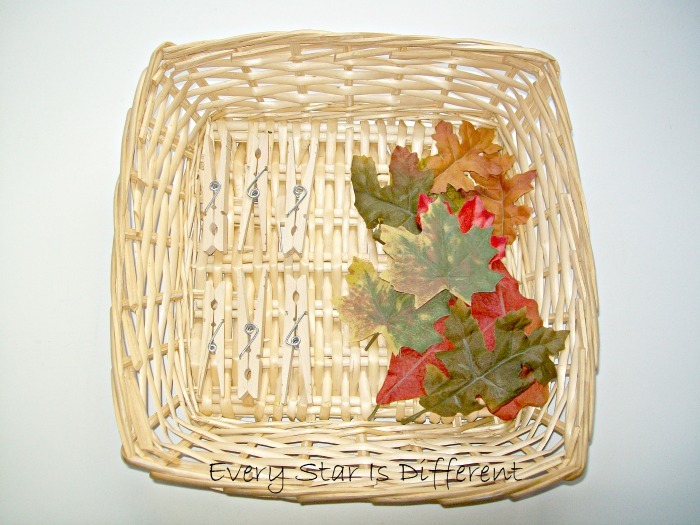 This is how it works in the Montessori world anyways. 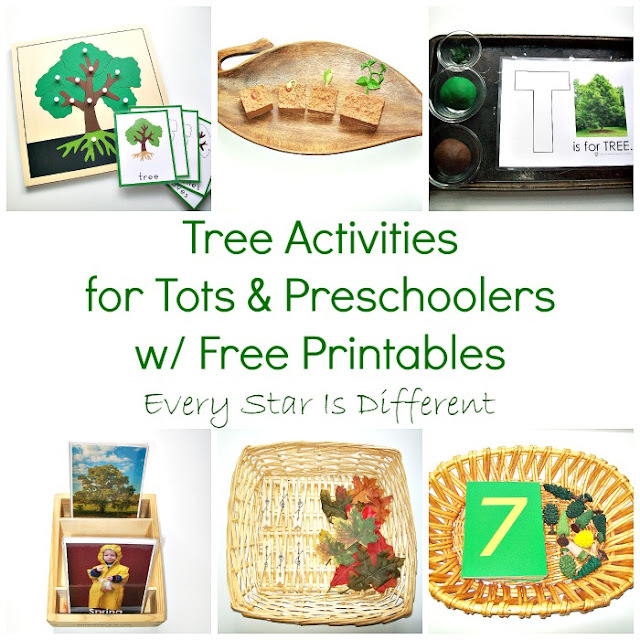 So I bring you our tree activities for tots and preschoolers with free printables! Here's what's on Sunshine's shelves right now! Sunshine has LOVED this letter activity. She's enjoyed rolling out the play dough and placing it on the T. Her favorite part is placing the button leaves on her "tree." "Look! 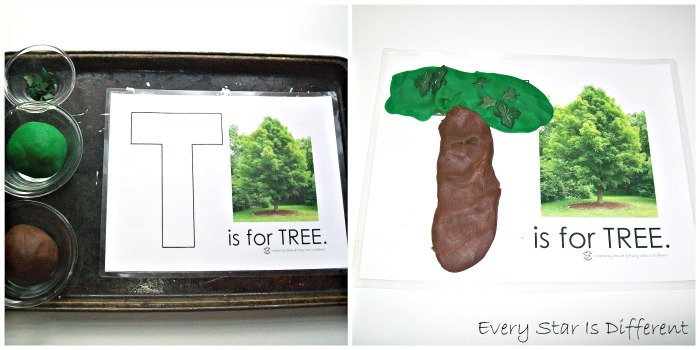 It's T for TREE!" She was so excited. This is the second incident this week that she's noticed the letter T while doing another activity. Hooray for progress! Source: I created the printable for this activity as part of my Tree Activities Printable Pack 1. For your free copy, click on the link at the bottom of this post. Sunshine can count to 6 finally! 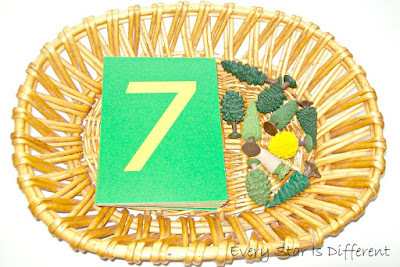 This week we move on to numbers 7-10. In this activity Sunshine will select a Montessori Sandpaper Number card, identify the number, trace it, and then count out the number of Safari Ltd Trees to match the number on the card. 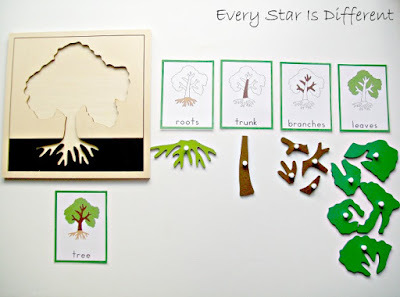 Trees are a fabulous way to learn about the four seasons. In this activity Sunshine will match up tree cards to clothing cards. I have written the names of each season on both sets of cards as a control. 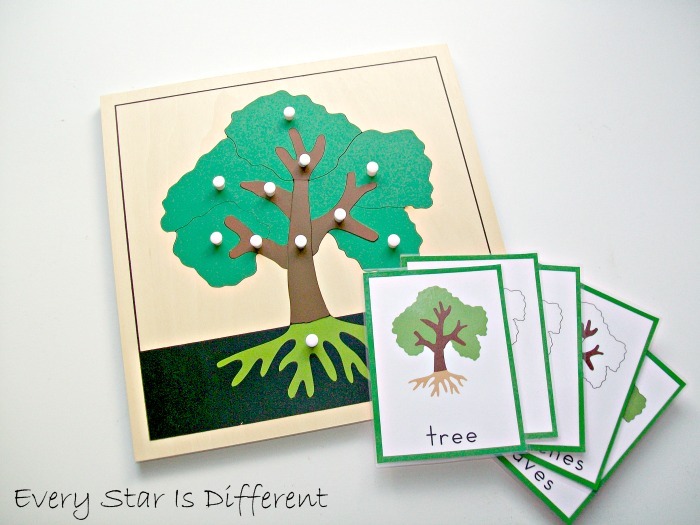 Source: I created the printable for this activity as part of my Tree Activities Printable Pack 1. For your free copy. click on the link at the bottom of this post. 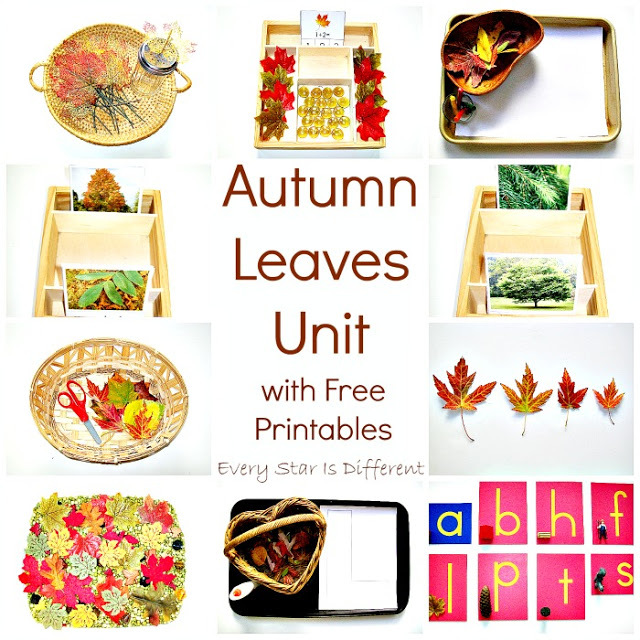 In this activity Sunshine will find the matching leaves. She will need to study both the color and shape. 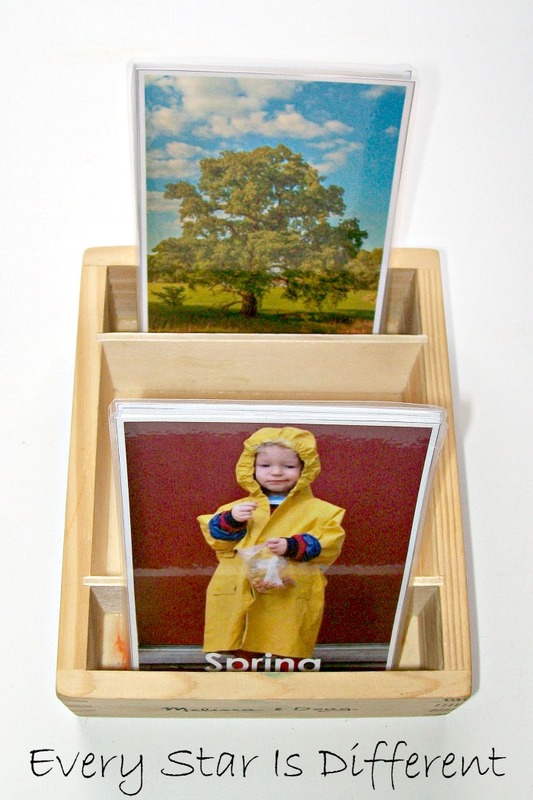 Once she finds a match she will use the clothespins provided to keep them together. Sunshine loves working with Clothespins. I love the fine motor practice they provide. Sunshine isn't quite ready to understand the vocabulary surrounding the life cycle of a plant, but she is ready to sequence plants according to size. That's exactly what she's doing! She's practicing the vocabulary words small, big, bigger, and biggest. Sunshine is delighted when she puts them in order and can see that she's right. The life cycle of a plant manipulatives in the activity above were sent to me as part of the Shouts and Sprouts Kit from Montessori By Mom. Sunshine isn't quite ready to put this tree puzzle together by herself, but she is ready to learn about the parts of the tree. For this activity she will remove pieces from the puzzle and sort them by part. When finished, she is welcome to help Mommy or Daddy put the puzzle back together. She has enjoyed helping everyday and loves the teamwork aspect of putting her work away. 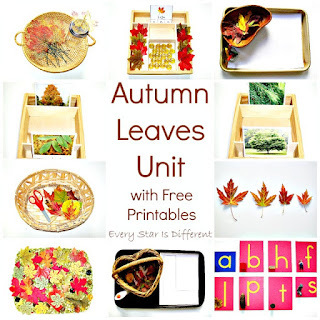 Source: The free printable for this activity can be found at Trillium Montessori. 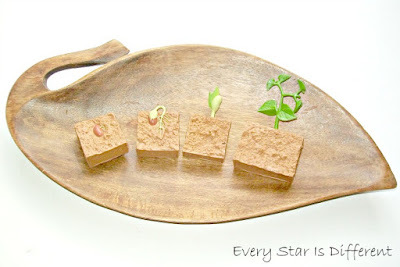 As mentioned above, the puzzle for this activity is part of the Shoots & Sprouts Kit from Montessori By Mom. There are so many awesome tree activities in this post! I love how you have the cards to match the puzzle. Fun! This was awesome!!! I love everything about this unit and all of your great ideas that you added. 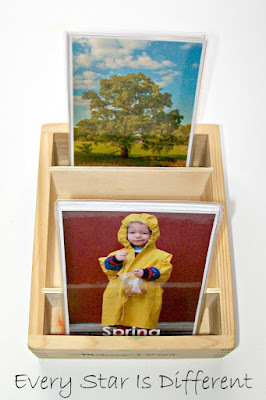 I would love this Montessori by Mom kit too. 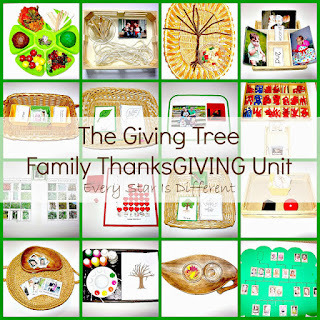 What a great selection of tree activities. I have to say, I like the idea of using the brown and green playdough to make a T. That is neat. 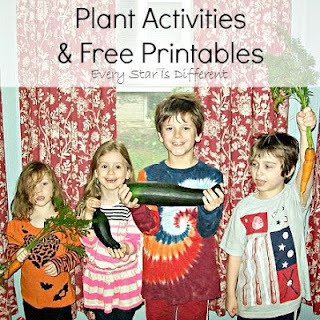 Thanks for stopping by and linking up on Littles Learning Link Up. LOVE these activities, Renae! :) So much fun, especially the playdough colors! 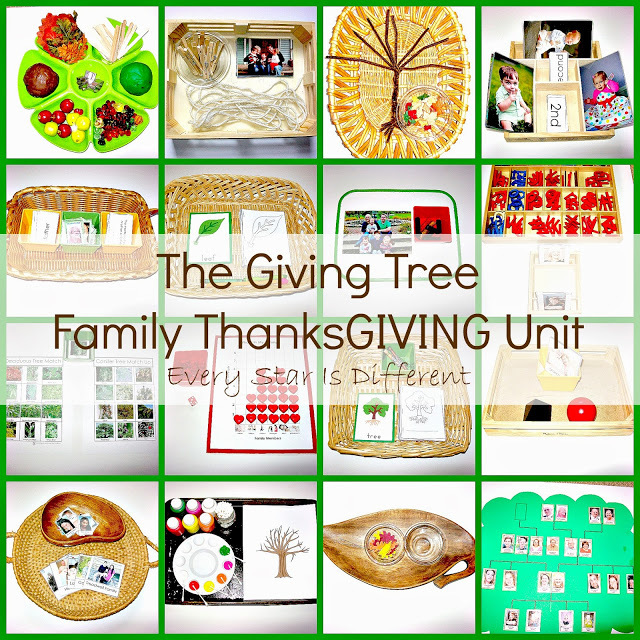 Thank you so much for stopping by the Learn & Play Link Up! This post is featured on Christian Montessori Network this week.